I've reported all of this before, however the day before the event opens to the public seems like the ideal time for a recap. This weekend, Capcom will be attending the 'Kyomaf' event in Kyoto to promote Sengoku Basara 4 with tofu, pickles, seasonings and other goodies. The big news is that they'll be launching the special travel CD which goes on general sale later this month. As part of the celebrations, seiyuu Morikawa Toshiyuki (Katakura Kojuurou) is scheduled to participate in a stage event tomorrow at 12:30 with series director Yamamoto Makoto and producer Kobayashi 'KobaP' Hiroyuki. They'll be discussing Sengoku Basara 4 as well as talking about the CD, so it's very likely we'll see some new rumours emerging after the stage event takes place. There will also be a second Sengoku Basara 4 stage presentation at 13:30 on Sunday, this time without Morikawa in attendance. Though it was originally reported that the Saturday stage would only be open to fans who won the right to attend in a special lottery draw, the Kyomaf website seems to have removed all reference to this limitation so I'm not sure it's still the case. The Sunday stage is open to all attendees. My personal theory is that Morita Masakazu (Maeda Keiji) might appear at one or both of the stage events as a surprise guest - Keiji is the star of the CD, his story has close ties to Kyoto and it would be the perfect way to give the stage event a boost. It feels very likely that we'll get a hint about his role in Sengoku Basara 4 this weekend, but if we don't I'd certainly settle for the unveiling of a new gameplay video to whet peoples' appetites for the playable demonstration at the upcoming Tokyo Game Show. Let's wait and see what Capcom have in store! Accompanying yesterday's scheduled update to the official Sengoku Basara 4 website to add the character portraits and open the 'System' section, gaming websites Famitsu, Gamer, 4Gamer and Game Watch have all posted articles to share some of the new pictures from yesterday's magazine reveal. There's one additional thing I want to mention for the benefit of anyone thinking about importing the new game but intimidated by the language barrier. Nine Demons Yoshitaka has translated the stage select screens on the official website so you can judge whether the Japanese-only interface will be manageable or not. 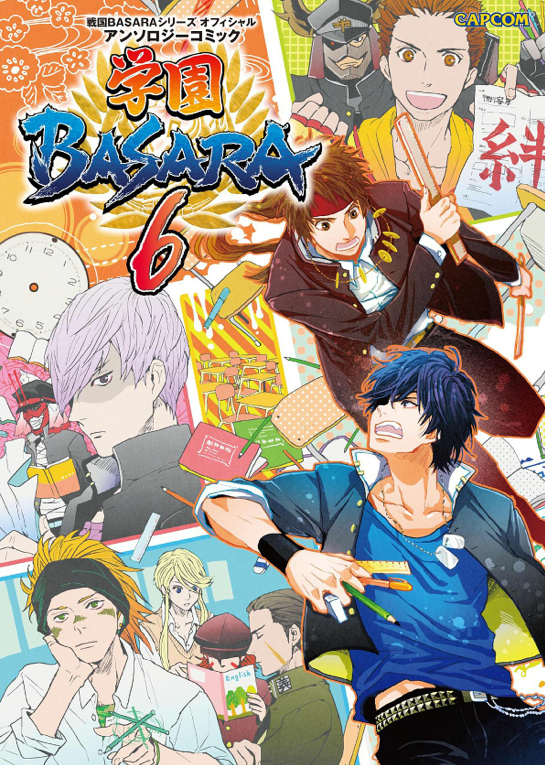 I was becoming anxious that the new Gakuen Basara 6 manga anthology might have been delayed after having heard nothing about it since its initial appearance in bookstore catalogues a month ago. Not so - the 164-page anthology now has both cover artwork and a formal release date of 28th September 2013. The theme of the stories this time around will be studying for exams, and there hasn't yet been any formal update to the list of artists that I posted in the previous article. Regular Gakuen Basara contributor Nari has provided the elaborate cover illustration once again. 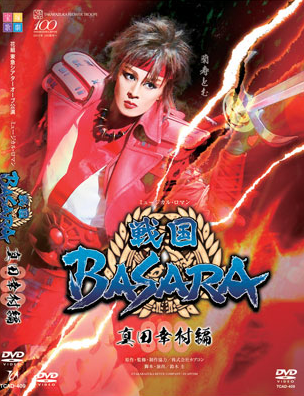 The e-Capcom store has posted the cover art for the highly-anticipated DVD recording of the Takarazuka Revue's musical from earlier in the year, Musical Roman 'Sengoku Basara' -Sanada Yukimura-hen-. The DVD edition is going to be released on 17th September 2013 and since it's relatively easy to buy from overseas it won't be long before foreign fans can finally see what all of the fuss was about. 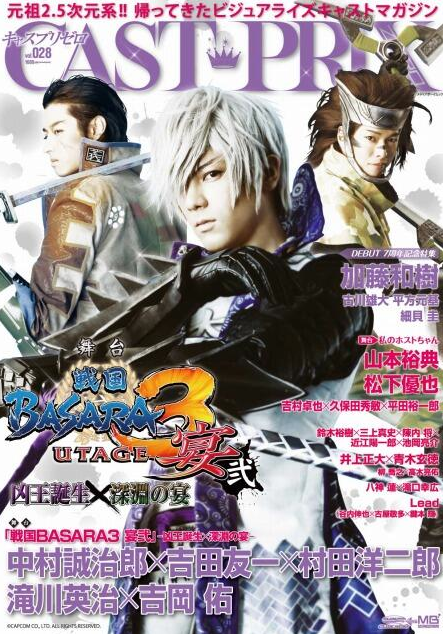 Fans of the Butai Sengoku Basara series may want to pick up volume 28 of Cast-Prix magazine since it has a huge feature on the upcoming Sengoku Basara stage play due to run this November, Butai Sengoku Basara 3 Utage Two: Kyouou Tanjou x Shinen No Utage. The three main stars take the cover. Issue 28 goes on sale on 13th September 2013. As part of the preparations for Tokyo Game Show 2013 which is taking place in a fortnight's time, the pair behind the Sengoku Basara series have posted a video on YouTube. They don't really say much, but perhaps some people reading this blog are curious about what the two of them look and sound like? Hopefully we'll hear more from KobaP and YamamotoD when TGS begins!